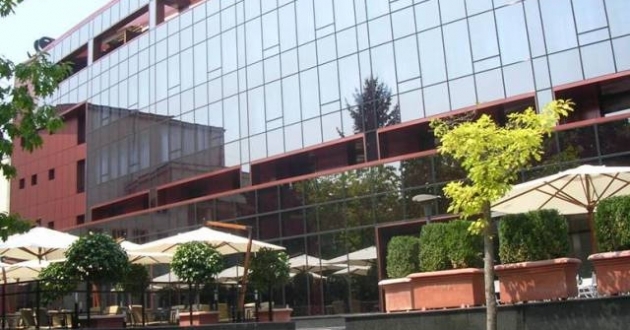 Location: Presidivm Palace hotel is situated in the heart of Lovech, on the main pedestrian street, near the administrative and the business centre. In neighbourhood you can visit the unique covered bridge - the only one of this type on the Balkan Peninsula, which was constructed by the great Bulgarian master builder Kolyo Ficheto. Accommodation: 3 single rooms and 45 double luxury rooms. The rooms are modernly furnished, equipped with a TV - set, Internet access, mini bar, A/C, a telephone, personal safe, radio and bathroom with bathtub. Two of the double rooms are suitable for disabled people. In the hotel: restaurant, lobby bar, fitness center, sauna, sport hall, shops for perfumery, cosmetics and souvenirs, hairdresser’s.